Welcome to the first post in our 7-week blog-a-thon on #closereading. We invite YOU to join in! Find more on how-to here. Several selected posts will be linked to on the Contributors page. Let’s closely read the practice of close reading together! Just as I suddenly–and against my will–have now heard hundreds of people use the term “twerking” in near constant use, from the VMAs to news anchors to walking into the grocery store… and I don’t think everyone is using it correctly (if you don’t know the definition, please do not hold me accountable for what you google)…, it seems that once a term comes in vogue everyone uses it to define everything. What were once called “textbook questions” are now being called close reading. Excuse me, is that classroom of students independently reading? Oh, no, no, they are cloooose reading. Standardized test questions are actually all close reading questions (see PDF page 15). Filling out worksheets: close reading. Doing book reports: close reading. Listening to a read aloud: close reading. What we lose when we place the term just anywhere is the ability to be specific and purposeful in our instruction. Could some of these instances be, or at least include, authentic close reading? Sure. Should all of these automatically be considered the practice of closely reading? Heck, no. We find Patricia Kain’s work from the Writing Center at Harvard instructive. That close reading is making careful observations of something and then developing interpretations from those observations. In other words, we stop to look carefully at choices an author (or painter or musician or director or architect) has made, and then develop ideas from what we have noticed. 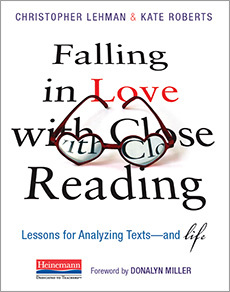 We agree with Doug Fisher that close reading is an interaction between a reader and a text, an extension of the critical reading theory of Lousie Rosenblatt and others. Implicit in this is that the reader is reading. Actually reading (insert: underline x infinity). Yes, we can teach lessons about close reading, but if our students are not holding their own books and working to apply these skills then we probably are only close teaching, they are not actually close reading. We do, however, disagree with one point Doug makes in that video interview, a point some others have made about close reading as well. We don’t believe that close reading, historically, had anything to do with “text dependent questions.” Sure, if students learn to analyze texts carefully they might just get better at standardized tests or in-class quizzes, but that would be a result and not a goal of close reading. Frankly, in our experience researching close reading methods in classrooms around the world, we have not found it necessary to rifle students with questions they must search for. Instead we find it more important to help students observe, interact, and find their own questions and interpretations. …they will have to on their own many times anyway! We also find Kylene Beers and Bob Probst’s explanation of the characteristics of close reading from Notice and Note to be instructive (see page 36). Particularly that it often involves rereading of short portions of a text with intensity, and then you bring ideas from those short rereads to longer sections of the book. That is to say, other than Graduate Students of Comparative Literature, we would almost never require students to reread and closely analyze every page of a text. There is just no time for that in a busy classroom. More importantly, rereading page after page after page is an engagement killer and kids who don’t read don’t learn to read well. We have a choice to teach in ways that either raises engagement and joy or smashes it to bits, so we agree it is important to teach students to stop and observe small sections and then jump back into their love affair with the unfolding story or fascination with the ideas of an article. Finally, we believe that close reading is not simply a way to analyze texts. It is a way to study the things that we love more carefully and appreciate their subtleties more fully. Close reading can be applied to texts, but we also can look to songs, videogames, television shows, art and even our daily lives. We observe the choices a chef made when our meal is presented to us at the table (“wow, this looks so good… are those mushrooms?”) just as we form interpretations off the little things our partner does (“she is either doing this to make me feel special or because she wants to ask me something…”). Our students deserve to have experiences with close reading not only be “task” driven, but instead be life driven. Do students have opportunities to practice these skills independently in your classroom or do you find a large portion of time is spent under your direction? What could you adjust? Are students internalizing habits for observing and reflecting? How do you know? Do your students think of close reading instruction as being question-answer specific or as observations-understandings interpretive? Do you see evidence of them applying skills more and more without prompting? How can you strengthen that trend or revise your instruction to see more of this? Do your students see close reading as only living within the pages of a book and only during your class period? Or do they see this as skill for living a more wide awake life? As our blog-a-thon party rolls on over the next 7-weeks we will continue to think with you about topics such as: why on earth anyone would ever want to close read nonfiction, instructional methods that tend to support the deepest independent learning, and how close reading does not live only in books. Look for the next post this Thursday on Kate’s blog, she’ll be posting about the “5 corners” of a text. What are your definitions or what you consider misuses of “close reading”? What have we gotten right in our’s or what would you revise? Have you experienced misapplications of the term? What have you done or are now thinking you could do about these misuses? What new ah-has or questions are you thinking through? Join us in our blog-a-thon! Add the button to your post and paste the URL in the comments below and boom, you’re along for the ride. “Close Reading” is a term found in the Common Core State Standards. As teachers are trying to learn and pour over all the new vocabulary from these standards and to grasp what it is the standards are trying to say, I think they are grasping to understand fully what this term means. This is a very good blog post that allows for a better understanding. Thank you for sharing!! Sorry just have to respond… Your interesting hook about “twerking” made me laugh. I guess I should google it because I mortified my 14, 12, and 11 yr olds when I said the word aloud on a tour and a teenage girl and her mom gasped when they heard me! I will have to read “closely” to get its true meaning! This blog is great! What a great post to get us thinking about close reading. When you write, “Yes, we can teach lessons about close reading, but if our students are not holding their own books and working to apply these skills then we probably are only close teaching, they are not actually close reading,” I am wondering what this looks like in kindergarten and first grade. I am struggling to visualize what this looks like in practice (the way you explain it) in those grades. Thoughts? Thank you! intrigued by your definition, especially the part that speaks to students doing this work independently. It is making me consider the purposes we as teachers set for Close Reading and wonder if/how the Standards for Reading Literature and Informational Texts can provide guidance. Perhaps they could help teachers identify the “how” when modeling Close Reading in different genres and the “what” when considering what we want students to be observant of when doing this work on their own. Thrilled that you & Kate are doing this, Chris, as there’s so much to think about! Here’s my contribution to the discussion, where I try to make a hopefully helpful distinction between ‘doing’ a close reading and reading closely. And as Fran suspected a few days ago, I think there’s a pattern emerging over the need to make sure we’re still aiming for student independence. Great explanation of Close Reading. I agree with you that oftentimes people do not have a correct sense of the term, and as a result, apply “Close Reading” to everything. Your definition is quite helpful. I have created a link to your blog on my blog. This is true. In fact, most people do not even know a definition of close reading. The post has made me ponder what close reading is and has given me some clarification of the term. From an elementary perspective, I am reading what you are saying about the independence of students as a goal that we need to build toward, beginning in pre-k. I see the use of text dependent questions that model analysis of text that is challenging and/or important as a way to do this. If not through the use of text dependent questions, how do you “help students observe, interact, and find their own questions and interpretations.”? Great question. My thinking is from a K-12 perspective as well, having taught, consulted, and researched in schools around the world. It’s been my experience in classrooms that you don’t need to ask text-dependent questions, at least not in the sense that some people are describing. Sure, I model constantly asking questions in texts that I am reading aloud. But I also teach children to then ask similar questions or have other ideas in their own texts. If I make the questions for them in their own books I only know if they can comply, not if they can do the work of deep reading (work of many of the standards) themselves. That said, see the other comments and replies about preK-2 readers. For me, the jury is still out on what version this could take or should take for them. Thanks for thinking with us! It’s a challenging topic and our conversations and debates make us stronger educators and better supports for our students! Thank you for your thoughtful response. I was reading this article, and wondering about your thoughts on the ideas within. Thanks, again, for the interesting conversation. With the deepest respect, I think that young children are very capable of close reading and responding to texts. The work of Debbie Miller, in “Reading with Meaning”, provides wonderful evidence of children being powerful learners who can develop their own questions and observations while engaging with & responding to text. I believe that teachers can best support K-2 readers by regularly engaging them in authentic conversations about the texts they share rather than spending too much time answering teacher constructed questions. I’ve gotten this question before and largely got upset and said, “leave those little ones alone!” But that was mostly because I was responding to a mandated PD to near force bad practices on primary teachers. You are raising this question more thoughtfully. Specifically, what is the pre-work we KNOW little minds can do. I’m still torn though. Sure, a huge part of primary reader habits is rereading for meaning. But close reading doesn’t seem appropriate instructionally at those grades, at least not in a deep analysis way. It’s a tough call, just err on side of letting them read a lot and getting out of their way! Open for more debate! I really like your “get out of their way” idea and want to clearly state that this is about “some” students and no interrogation by questions sucking the life out of reading. Students who ARE reading when they come to kindergarten do need to be encouraged to consider all the patterns in the text and the illustrations. I am not advocating for “every reader” or “every text.” That would be SO inappropriate! It’s a good point and making me think. I tended to just say a flat out “no, boo.” But it is true that some kids are ready for different work…. and all kids can often do way more than we first think. This is good to chew on. Thanks for the post, Fran! Chris I love love love that you are considering the little minds. Too often they are over-looked and unfortunately still expected to “close read”. I believe their close read has a slightly different look. I believe a young reader close reads by turning on his/her thinking and not merely reading the sounds and words. They close read by engaging their mind. That sounds so very easy and logical for mature or adult readers. I believe it is about those young minds making text to self connections, text to text, text to world, making predictions, being able to laugh, cry and feel as they read or a story is read to them. And ultimately being aware of the very thing they are thinking. It takes time to be independent in this skill. But they can tune into their thinking when listening to an adult read and share their thinking without having to focus on decoding. Unfortunately many young minds are never expected to be turned on. Oh boy they CAN think and engage when given modeled, or acted and given the opportunity with many mediums. I love the young mind and close reader! Thanks for trying to set the record straight on one of the latest hot ‘trends’ in education. I would also add that close reading also isn’t quick! If you want students to meaningfully interact, interpret and consider text, it’s going to take time. It’s also going to require a lot to hands-on assistance from educators – at least until they get the hang of it. Once they do – surprise – it’s time to ratchet the text up and give them something deeper to grapple with. Your last two bullets seem like what we really want to be striving for: to have students take more ownership in this process *and* start seeing this as a strategy that can be applied to other areas, like life! Is close reading just a new term for being observant when reading? Funny thing is, it’s an “old term” having a rebirth. I’d agree it’s about being observant, but I think having a specific term also helps the reader to be observant in particular ways (and teachers as well). I could be “observant” of, say, an object that returns back in a story. Or I could close read one passage (rereading a few times to notice patterns or choices I may have missed first time). That’s our take at least. I first heard this term 15 years ago at UCLA during the CA Literature Project’s Summer Institute. It has had a lifelong impact on how I interact with text. Thanks for instigating this conversation. After “close reading” this page my reflections are: I need to MODEL close reading more with my students. I need to reread, think aloud and share my interpretations, questions, reflections, jot down notes and get excited over the aha moments. I need to “explicitly” teach HOW to close read and share the passion that comes from interacting with text. When I release them to read independently, as I monitor, guide and observe and gather formative information, I need to ask them more questions about where they chose to reread and what are their interpretations. I need to gather a list of questions I can use with my students to observe and see if they are truly close reading and engaging with the text and not just comprehending it. Thanks for making me a better teacher, which in turn influences the learning of many students. Thanks for sharing. I know what I am reading today. I love the idea of having a mindset of close living. Teaching students to be closely observing the world around them. Practicing with something that they think they know well, maybe a video game, a pair of shoes and notice what repeats, what contradicts their expectations and wonder why. Being observant of the world is a practice many lack (I’m picturing adults intently looking at their smart phones while the world passes them by). The close reading of everything is impossible and a perfect way to make reading miserable. Getting students to see the value of close reading is my mission this year. In read aloud I usually start a book using Vicki Vinton and Dorothy Barnhouse’s What do Readers Really Do strategy of Know and Wonder. I jot, ask students to wonder, talk, jot. If a student says, “whoa, we got a lot out of just one page,” that student got the point. My challenge is to get students to do it well in their own books without me guiding. They practice the know/wonder strategies in their notebooks as they read, some need a push to wonder not just know. I’ve taught the first two signposts from Notice and Note and had students flag their text when they find them. But I haven’t taught them to really go back and study those moments. Next steps, going to office depot to buy different colored post its for different sign posts. Thanks so much for pushing me to do more. I’m looking forward to Thursday. This is a great beginning to this Blog-a-thon and I am certainly refining my own thinking as I read YOUR posts CLOSELY! I’m thinking that our reading can be divided into 3 kinds as I noted in my own reader response this morning! Applause! I love this comment, and agree completely. I think one of the elements left out of much of the discussion on close reading is how the kids will learn how to do this important, beautiful work on their own. And that always comes back to our best practices. I have the good fortune to be in a host of schools, and the thing I see above all else is that the kids learn what we teach them, what we model and coach and scaffold. I too have discovered that one of the best ways to “teach” my students how to close read (we also call this “active reading”–has anyone else used that term?) is to model it myself. I find this especially helpful when my students an I read the same passage independently. Then, I share with them how my thinking unfolded and what prompted me to annotate the text as I went. That way the students have a means of comparison to their own thoughts–this provides not only discussion, but also maybe an “ah ha” moment of realizing how personalized the reading process can be.